This week more than 1,500 consumer packaged goods (CPG) and retail professionals came together in Austin, TX, for the IRI 2015 Summit. I was fortunate to be one of a handful of trade journalists to attend. With the theme of “Accelerate the Path to Growth,” speakers focused on how to change the old way of doing business to complement the changing composition of the U.S. household, including consumers’ increasing dependence on digital mobile devices. 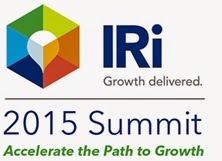 At the Summit, IRI announced its annual New Product Pacesetters. Once again, yogurt remains hot. Four products, including Chobani Simply 100 (No. 3 on the list with $120.9 million in sales), Activia Greek (No. 5; $86.5 million), Chobani Flip (No. 6; $83.2 million) and Yoplait Greek Blended (No. 10; $69.4 million) all landed spots on the ranking’s top 10. 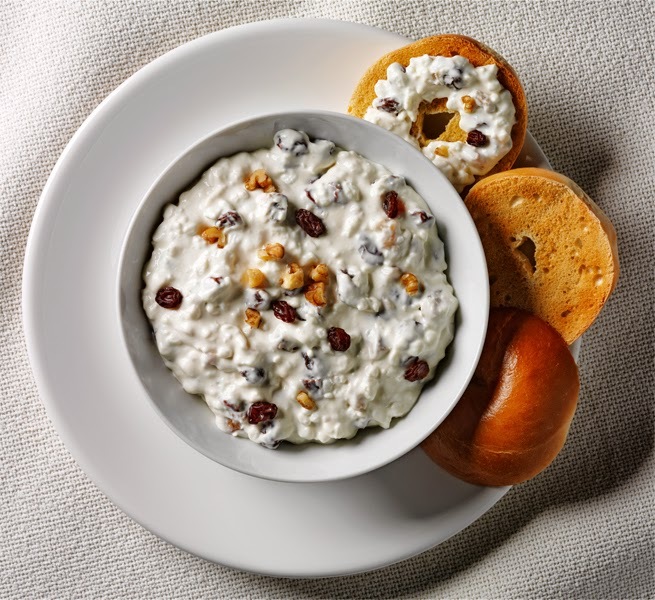 “Consumers cannot get enough of that protein filled, on-the-go snack and meal time replacement,” said Susan Viamari, editor of Thought Leadership for IRI. To read more about the New Product Pacesetters, you can link HERE to a comprehensive article written by Keith Nunes, executive editor of Food Business News, who attended the conference with me. Thomas Greco, CEO, Frito-Lay North America, emphasized the importance of leveraging science as the foundation for innovation and growth. He explained how the 50-year-old Gatorade brand has always focused on the athlete and how the beverage drives competitive performance. Watch an impressive Gatorade video HERE. Starbucks fans get ready for this: a new app feature that allows you to order your beverage and it will be ready at the pick-up counter in four minutes. Michael Conway, president-global channel development, Starbucks, said the feature is just debuting in select markets but should be available nationwide by the end of the year. He also said that currently, about one-third of in-store transactions are cashless. Specifically, 18% are made through the phone app. “U.S. households are getting smaller,” said Denise Morrison, president and CEO, Campbell Soup Co. She cited data showing that only one-fifth of U.S. households include families with married parents and their own children. Further, in 1950, 78% of U.S. households were married. In 2010, this figure dropped to 48%. “The new American family household is more like a mosaic. And every member of that household wants to be recognized as unique,” she said. “They are demanding that companies and brands connect with them.” She explained there’s an explosion of interest in fresh and packaged fresh foods. (This is great for dairy!!!) “Winners will be companies that adapt successfully; that have differentiating principles and authentic ideals that resonate with consumers,” she said. Branding is helping the product be more of what it is. Consumers’ current attention span is nine seconds. It used to be 20 minutes. After nine seconds you either have to renew their attention or they move on. To renew, you need to create a fascinating experience. To watch a five-minute video recap of day one at Summit, link HERE. To watch a five-minute video recap of day two at Summit, link HERE. The cheese departments—both packaged dairy case and specialty deli counters—are reinventing themselves, and innovating through differentiation in order to fascinate the consumer. The growth of online shopping, snacking, bold flavors, pairings, convenience foods and an on-going trend of consumers choosing natural, artisan foods will impact the ways Americans eat cheese in 2015, according to the Wisconsin Milk Marketing Board (WMMB). With American cheese consumption increasing 42% over the past 25 years, according to USDA figures, there’s no arguing that U.S. cheese consumption is at an all-time high. While opportunities for continued growth in the category appear strong, the ways in which people are consuming and enjoying cheese continues to evolve thanks to marketers who provide points innovative options. 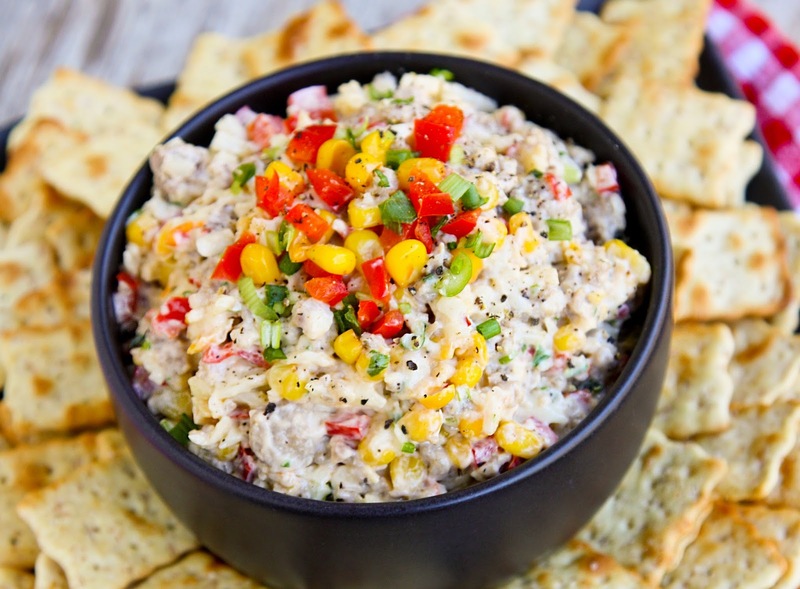 Mega trends like natural and specialty cheese consumption, the Millennial generation’s impact on the food industry, snacking and the growing use of social networks and apps for recipes and purchase decisions will continue to gather momentum. 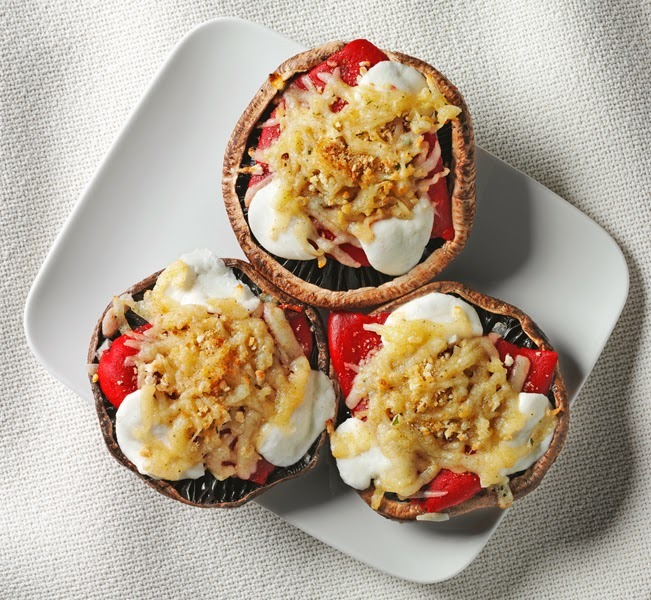 The top cheese trends also reflect the constant evolution of the American palate and a growing desire for unique, bold flavors. With a cheesemonger. According to a recent report from the International Dairy-Deli-Bakery Association (IDDBA), shoppers are looking for more from their primary stores when it comes to specialty cheese. As a result, each year, grocery stores are moving closer to becoming restaurants with expanding prepared food choices, dine-in space and chefs and cheesemongers taking up residence. With an expanding palate and more choices from their neighborhood cheese expert, more and more Americans are exposed to and are consuming natural, artisan cheeses. As a snack. Social media and guiltless food bloggers have taken snacking to the next level, making it okay for us, particularly women and millennials, to express our obsession with snack foods. It’s having a big impact on how Americans choose their “meals.” According to a recent report from IDDBA, snacking represents 50% of all eating occasions. Cheese is well aligned with today’s growth trends in snacking and enjoys a position as a unique snack, both healthy and indulgent. In 2015, consumers will snack on cheese in all forms, from simple string and cube nibbles to elegant cheese picks and meal-replacing cheese boards. With hard cider. Hard cider and cheese is the next big thing in food and beverage pairings. Dry ciders pair well with rich, buttery cheeses like cheddar, aged gouda or blue, while semi-sweet ciders are perfect with mild, nutty, soft-ripened cheeses such as brie and camembert. With the array of new pairing options, we’ll see cider and cheese combinations in high-end restaurants, hip eateries and at home. In their sweets. Our obsession with trendy baking and cutting-edge pastry chefs has made unique flavor combinations mainstream and impacted how Americans view their sweets and breakfast foods. Cheese is the perfect addition to traditional sweets like cookies and pancakes to satisfy sweet-salty cravings and the answer the constant search for unique twists on classic flavors. This year, we’ll see more sweet-savory cookies made with cheddar, blue cheese and other cheeses and more pancakes with cheese fillings and savory ingredients such as ricotta, blue, Swiss and gorgonzola.To read a recent article I wrote for Food Business News on cheese ingredients, link HERE. With a kick. According to IDDBA, shoppers, especially Millennials, are increasingly looking for cheeses that reflect their globalized palate. The constant search for unique and bold flavors will continue into 2015 as consumers crave cheese with hints of jalapeño, herbs, smoke, garlic and basil, as well as bitter flavors like espresso. At their convenience. Convenience remains a top priority for consumers. Cheese slices, shreds, spreads and snack sticks make up a large share of convenient products launched over the past year and will continue into 2015. According to the WMMB’s custom IRI database, shredded cheese will continue to outpace other top forms of cheese and account for a 27% volume share of the total retail cheese category. Two other convenient cheese forms are cheese curds and stick cheese, both achieving double-digit volume growth rates each year. With a story. Sales of natural cheese have steadily been on the rise for the past few years and the trend isn’t going anywhere. According to the WMMB’s custom IRI database, natural cheese accounts for close to 80% volume share of the total retail cheese category. The recent shift in the consumer need to know where food comes from will take cheese buying to a whole new level in 2015. According to IDDBA, the recent call to get closer to your food has taken food beyond “natural” into the realm of authenticity, transparency and storytelling through cues around “local” and “artisanal.” Not many foods tell a better story than cheese, and with 600 varieties, types and styles coming from Wisconsin’s finest cheesemakers alone, they’ll be a top choice at U.S. groceries in 2015. With a smartphone. More than two-thirds of Americans are using smartphones, according to Nielsen data. Of those, more than 80% of Millennials are using a smart phone and rely on their mobile devices when shopping. They’re choosing, planning, experiencing, sharing and buying food online, and that includes cheese. New mobile websites and apps, such as Wisconsin Cheese Cupid that you can link to HERE, help shoppers pair cheeses with their favorite beer, wine or spirit. I would like to add a ninth way, and that’s with bacon. Before heading to Austin, I attended the 7th Annual Baconfest Chicago. Bacon and dairy—cheese, dips, ice cream and even yogurt—go together. To read more about this trend, link HERE to an article I wrote on the event for Food Business News. In conclusion, when it comes to using cheese in foodservice, the new Wisconsin cheese blends calculator from WMMB helps foodservice professionals expertly blend varieties of Wisconsin cheese for hot applications, maximizing for flavor and performance. 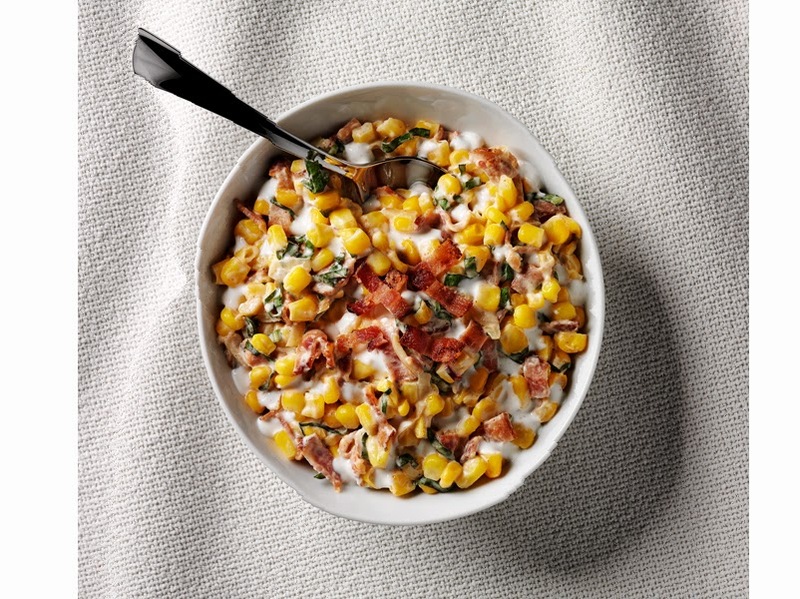 The new online tool features more than 500 customizable two-, three- and four-cheese blend combinations ideal for use in pizza, pasta, sauces, soups and more. This of course can be translated to the CPG business as well. You can link to this tool HERE. “The blends were expertly created taking into account the many factors that can affect cheese performance in a hot application, such as fat content and acidity, melt and browning ability, stretch, oiling off and more,” says Allen Hendricks, vice president of channel programs-foodservice at WMMB. Dairy Foods: White’s Boring! Add Color! It’s that time of year where people who live in “real” four-season regions are finally seeing color. Since the holiday lights were taken down after the first of the year, many of us—and God bless my friends in Boston who have had it especially challenging—have been only seeing shades of black and white…the sleeping trees, the newly fallen snow, and then that dirty, messy, previously white stuff that covers cars, sidewalks and our walk-loving pets. Today, the trees are budding greens and bulbs are blooming a rainbow of colors. It’s amazing how color uplifts the day. And then there’s milk….the perfect white canvas. In fact, artists have been known to say that whole milk is the ideal shade of white. But it’s a white begging for color. With dairy products, color is sometimes added for attention. Other times, it’s for correction, or simply to deliver to consumers the color they expect in strawberry yogurt and cheddar cheese spread. Here are seven recent innovations that rely on added color to provide an eye-appealing product. 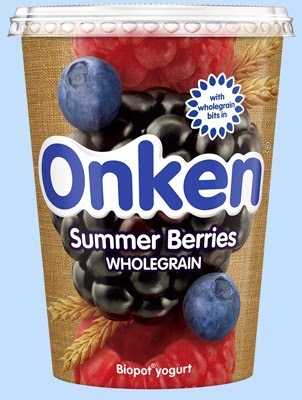 Just in time for the warmer weather, Onken (in the U.K.) is marketing Onken Biopot Wholegrain Summer Berries. This is a blend of creamy yogurt with summer berries (blueberries, blackberries, raspberries and elderberries). It also contains five different types of wholegrain cereals (rye, wheat, oats, wheat bran and barley) for a chewy texture that bursts with berry flavor. This variety, as well as the Strawberry variant, relies on beetroot juice concentrate and carrot juice to round out color. There’s also a Peach variant that includes peach juice concentrate for a color boost. In the U.S., the latter product could be described as being naturally colored, as peach juice is being used in a peach product. The berry varieties could only be described as not containing artificial colors. Tarte Asian Yogurt is a unique French-Vietnamese fusion yogurt produced by a namesake family-owned and operated company located in Southern California. Winston and Henry Lee found inspiration from their mother’s homemade Southeast Asian yogurt recipe after realizing a void in the yogurt industry and craving a nutritious, slightly sweet, somewhat tangy, real authentic “good for you” yogurt. The company began in 2010, and the yogurt’s debut was first reported as a Daily Dose of Dairy in September 2013. You can read the posting HERE. With no other products like it in the U.S. market, and with U.S. consumers craving new styles of yogurt, the product line was a big hit at Natural Products Expo West in March. Industry movers and influencers were impressed with its creamy consistency, delicate sweetness and subtle tartness. Unlike Greek yogurt, Tarte is not strained, which allows the yogurt to retain its natural goodness including higher electrolyte and calcium content, according to the company. When compared to traditional flavored yogurt, Tarte has an average of 60 fewer calories, 50% less sugar, and nearly double the calcium. Tarte also contains double the protein of regular yogurt, with zero fat. The yogurt gets its lightly sweet flavor from the natural milk sugars that are caramelized during a slow-cooking process. Extra sweetness comes from the use of a stevia-based sweetener, which keeps calories low (115 to 120 per serving). Tarté Asian Yogurt comes in five flavors: Original, Green Tea & Honey, Mango & Coconut, Blueberry & Acai, and Strawberry & Guanabana. The fruit varieties all use fruit and vegetable juice for color. Unilever Ice Cream is rolling out a number of new frozen treats for this summer. 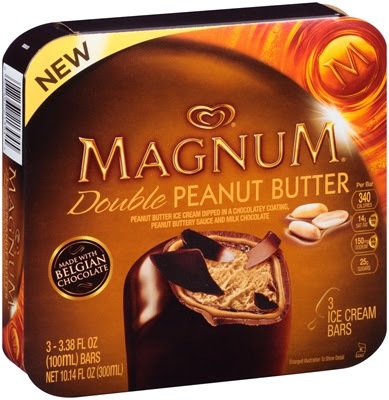 The new Magnum Double Peanut Butter bar is made with the perfect balance of rich peanut butter ice cream, peanut buttery sauce and Belgian Chocolate. Caramel color adds a visual touch of decadence. Each 3.38-ounce single-serve bar contains 340 calories and 24 grams of fat. 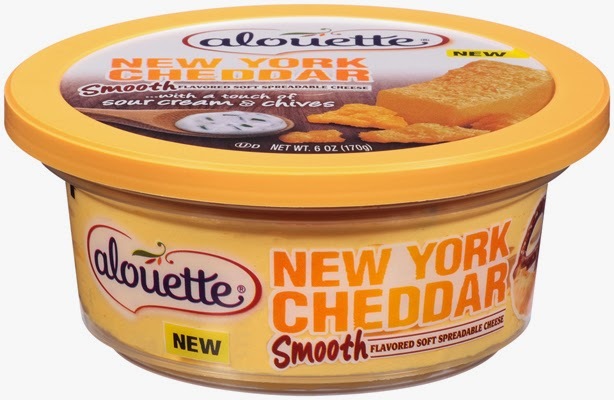 BC-USA recently added two new flavors to its popular Alouette Soft Spreadable Cheese line. New York Cheddar is described as a smooth spread with a touch of sour cream and chives. English-Style Brown Ale Cheddar delivers a bold kick of ale flavor that’s provided by malt extract. Both spreads use paprika and beta carotene to provide an eye-appealing cheddar cheese color. A 2-tablespoon serving of either contains 70 calories and 5 grams of fat. 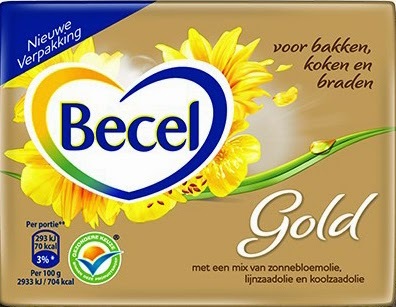 In select European markets, Unilever is growing its Becel range of dairy and vegetable oil blended spreads with a variety designed for baking and cooking. Like all Becel products, the company says this product is heart-healthy because of its omega-3 and omega-6 fatty acid composition. It contains 50% less saturated fat than traditional butter. A touch of beta carotene gives it a buttery rich color. Perry’s Ice Cream is just starting to launch a new ice cream line branded Escapes. These pint- and quart-sized treats are designed to take you on a journey, a flavorful one, according to the company. Colors help convey the adventure. When it comes to swirl, the Queen of Hearts flavor includes a raspberry swirl that relies on a red berry color to provide visual impact. That color is based on a blend of juices from black currants, blackberries and elderberries. Piece of Cake is yellow cake-flavored ice cream with chocolate frosting swirls and pound cake pieces. To communicate the richness of yellow cake, without adding extra calories, the cake batter ice cream base contains some annatto color. That’s also the secret to making the pound cake pieces look like they were made with pounds of farm-fresh butter. There are 20 flavors in total, all targeting adult palates. Stay tuned, this product line will be featured as a Daily Dose of Dairy this coming week. As Eva says, inclusions, and lots of them, are paramount. To read a recent article I wrote for Food Business News entitled “Inclusion innovation: More than a Chip or a Chunk,” link HERE. This final product shows us how important color is, as it truly makes the celebration. Friendly’s Ice Cream, the operator of more than 250 Friendly’s restaurants and a manufacturer of ice cream products distributed in over 7,500 retail outlets in the U.S., has combined forces with Crayola, a colorfully innovative brand, to introduce a new, one-of-a-kind, premium Crayola Decorate Your Own Ice Cream Cake. Topped with freshly whipped icing, each ice cream cake serves as an edible artist’s canvas that can be customized with packets of blue and red icing, rainbow confetti and green and yellow sprinkles that are included with every package. 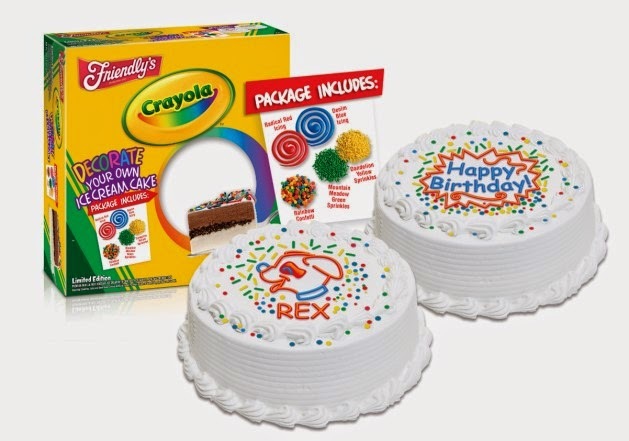 Perfect for birthday parties, family gatherings and celebrations of any kind, Friendly’s Crayola Decorate Your Own Ice Cream Cake is sold in a single 60-ounce size that easily serves 12 to 15 guests. Each cake is handmade at Friendly’s creamery in Wilbraham, Massachusetts, and boasts layers of creamy vanilla and rich chocolate ice cream separated by chocolate crunchies. Have a colorful spring day! Nothing like a long weekend during spring break with seven teenagers (three boys, four girls, all 15 years old) to gain insight to the grocery shoppers of tomorrow. These are the youngest millennials, having been born in either 1999 or 2000. They survived Y2K. And, oh my, do they have strong opinions of the foods they eat. When I asked for milk preference, they unanimously said 2%. One girl even went as far as explaining to me that it contained healthy fats. I was very impressed. But then one gal did say her mom likes to buy raw milk. Not to throw her mom under the bus, but I did break into a brief explanation of why raw milk is unsafe and why I will not be buying it. I’m not surprised that they do not understand the term clean label, as it really is not a consumer term. Shoppers are not walking up and down the aisles of the supermarket looking for the clean-label shelf. Retailers do not have a designated clean-label section, much like they do for organic and ethnic foods. 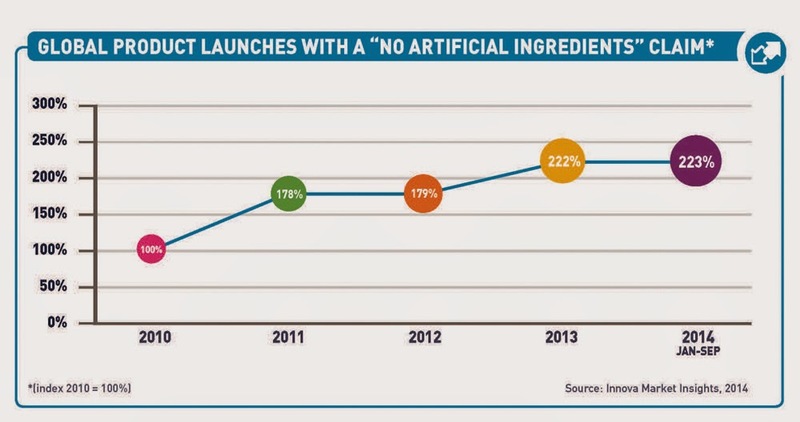 Clean label is a marketing initiative for the R&D team, with the effort often varying by product category. Clean label is not necessarily natural, which is a good thing, because natural is itself an ambiguous term. But I think we can all agree that natural infers that it came from Mother Nature, at least before it was processed and packaged, rather than concocted in a lab. It’s suggestive of good-for-you, minimally processed and even nontoxic. Clean label is sometimes that, and other times it is not. Clean label involves transparency, which refers to the act of communicating to consumers the story of the food they are buying. According to Clean Label Report 2015 from Nutrition Business Journal, no one in the industry seems to agree on an exact definition, yet suppliers, manufacturers and retailers are increasingly responding to and driving the movement. The report confirms that few consumers have even heard of the term, yet more and more of them are demanding food, supplement, personal care and household products that adhere to its strictures of fewer synthetic ingredients, fewer ingredients overall, “free-from” formulations and transparent supply chains. So while only 23% of consumers surveyed say they have heard the term “clean label” and have at least some idea what it might mean, 83% say they actively try to avoid high-fructose corn syrup and 71% say “no” to artificial colors and flavors, according to Nutrition Business Journal research. The report shows that these and other ingredients are quickly on their way out of the natural channel, with mass retail following suit. 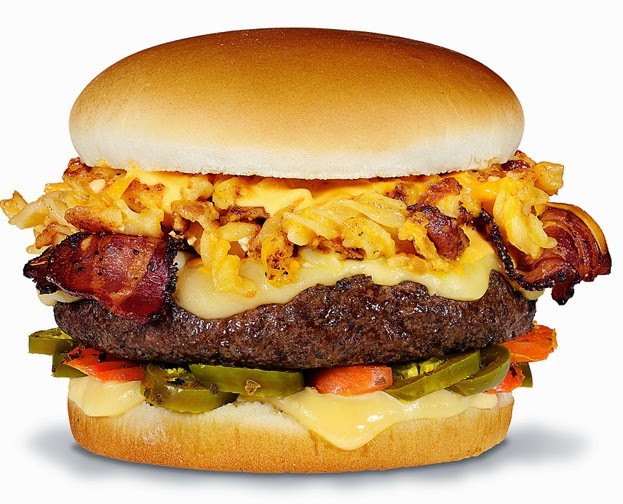 A recent report from Packaged Facts entitled What America Eats: Paradigms Shaping Food Choices identifies a number of positive shifts in American eating habits that bode well for the future. Chief among these is the finding that in 2014, 39% of consumers indicated they are eating less processed food than they were a few years ago. And while consumers are more likely to say they are shifting away from processed food, they say they are moving toward foods/food types that encompass “real foods,” such as fresh fruits/vegetables, locally produced foods and all natural proteins. Dairy is all this and more! At IDFA’s recent Ice Cream Technology Conference in St. Petersburg, FL, Doug Goff, professor of food science at the University of Guelph, addressed the formulation challenges for clean labels. He provided data showing that consumers are clamoring to buy products with clean labels, fewer ingredients and less food additives. 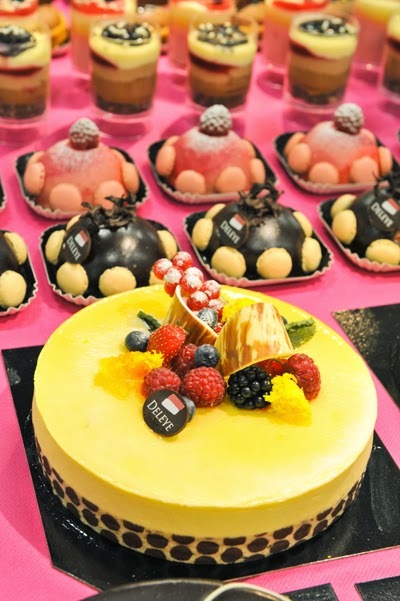 With ice cream, as well as refrigerated dairy desserts such as mousse and pudding, there are challenges with going clean label as emulsifiers and stabilizers serve key functions in texture, product stability, and with frozen products, controlling ice crystal development. The good news is that ingredient suppliers have stepped up to the challenge and have solutions to allow for cleaner-label formulating. Here are some recent clean/clear label product launches. 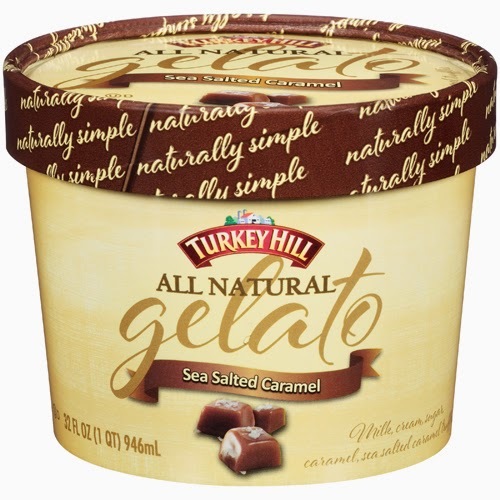 Turkey Hill Dairy is rolling out All Natural Gelato, making it the first major ice cream brand to release an all-natural gelato product line. 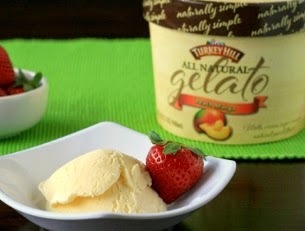 Turkey Hill All Natural Gelato contains fresh milk and real sugar, and has less air than most ice creams giving it a richer mouthfeel. 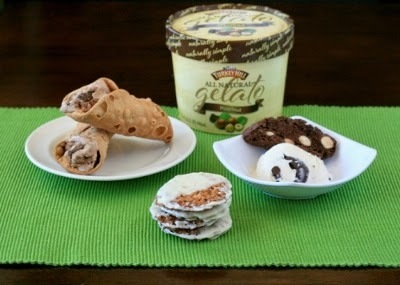 It is available in eight flavors: Chocolate Chocolate Chip, Chocolate Peanut Butter, Coffee Chip, Hazelnut, Mint Chocolate Chip, Peach Mango, Purely Vanilla and Sea Salted Caramel. In case you have not heard, the industry finally has the next Cookies and Cream. It is Salted Caramel. Read more about this trend in a recent column I wrote for Food Business News that you can access HERE. 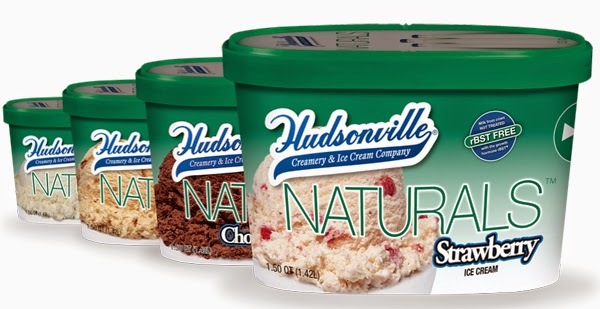 Hudsonville Creamery and Ice Cream Company is rolling out Hudsonville Naturals. This ice cream line is described as artisan and made with local ingredients, and natural colors, flavors and sweeteners. Front labels boast a “rBST Free” logo. The website explains how the ice cream is sweetened with pure cane sugar and how, for example, the strawberry flavor is colored by the strawberries. In addition to Strawberry, there’s Chocolate Cocoa Bean, Vanilla Bean, and surprise, surprise, Salted Caramel. Family-owned Graeter’s Ice Cream expands its hand-crafted, artisan ice cream and gelato line with five new flavors, providing consumers with an indulgent dessert experience. The new flavors are: Bananas Foster Gelato (super yummy! ), Bourbon Pecan Chocolate Chip Ice Cream, Black Raspberry Gelato, Dark Chocolate Mint Crunch Gelato and Toasted Coconut Gelato. 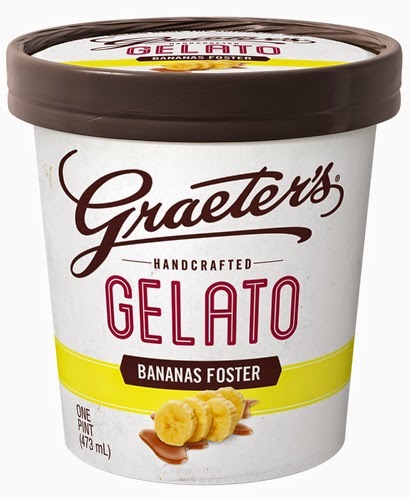 Entrepreneurs like Graeter’s Ice Cream are increasingly coming up with unique flavors that remain true to the brand’s original mission. That is, creating the finest, creamiest, most deliciously indulgent ice cream in the world, 2 ½ gallons at a time. Communicating this batch-made, hand-crafted process is all about the company’s clean and clear communication. Committed to creating healthy snacks made with simple, wholesome ingredients, the Outshine brand has launched a new line of Simply Yogurt Bars. These frozen yogurt bars are simply made with 100% yogurt and blended with real fruit or fruit juice. Flavors are: Blueberry, Lemon, Mango, Peach, Pineapple, Strawberry and Strawberry Banana. Each bar contains 90 calories, 5 grams of protein and 10% of the Daily Value of calcium. Simply Yogurt Bars also include live and active cultures. Outshine Simply Yogurt Bars are available in four-count boxes at a suggested retail price of $4.39 at major retailers nationwide. 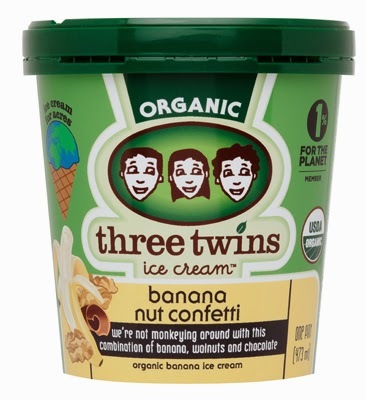 Three Twins Ice Cream, a San Francisco Bay Area-based organic ice cream manufacturer, celebrates its 10th anniversary with the rollout of two new flavors: Banana Nut Confetti and Cherry Chocolate Chunk. Committed to a giving-back model and providing a great product at an even better price, Three Twins created Ice Cream for Acres in 2011 and to date the land conservation initiative has saved nearly 130,680,000 square feet and counting. All Three Twins ice cream pints top out at $4.99 per pint and include a charitable donation to the Global Wildlife Conservation in collaboration with 1% for the Planet. The company uses USDA-stamped organic ingredients, including milk and cream sourced from family farms within a short distance of its factories. On the refrigerated dessert side of the business, French premium dairy processor, Marie Morin, which now manufactures product in Canada and exports to the U.S., uses clear glass packaging to communicate the simplicity of the product inside. 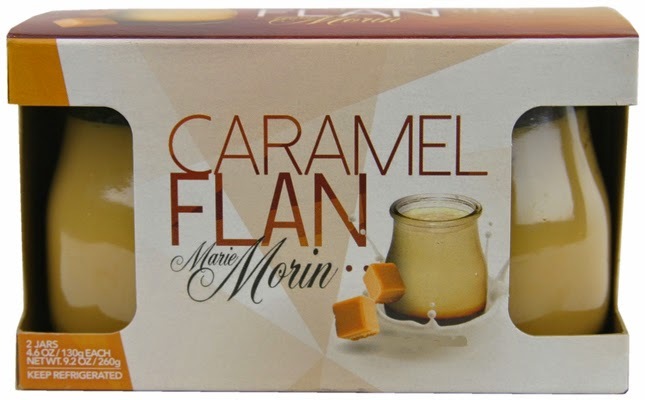 For example, Caramel Flan is a creamy custard baked with a layer of decadent caramel sauce. Made with only natural flavors, this product comes in two packs of 4.6-ounce glass jars. Something I learned during my weekend with the youngest millennials, just like every generation before them, they do not always do as they say. But they definitely are more knowledgeable about food then previous generations, which is why clean and clear is so important.